What’s Cooking in the Science Oven? It has been about a day since I finally got around to seeing “American Hustle”. I want to say this is going to be a thoughtful blog post about that film’s message about reinvention or how life is just a series of cons. Honestly though, all I want to talk about is the science oven. Those of you who have seen the film know the “science oven” is a term given to a microwave given as a gift to Christian Bale’s character, Irving Rosenfeld. The movie is set in 1978, so the microwave doesn’t bear much resemblance to the microwaves of the 21st century. Instead of buttons and digital screens, there are dials and knobs. Rather than open like a door from the side, the microwave door is pulled down, kind of like a drawbridge. If you ask me, the comedy of the “science oven” scene featuring Bale, Jennifer Lawrence as his troubled and troubling wife, and a little pyrotechnics is the highlight of the entire movie for me. I think this is probably true of a lot of people, but for me, the microwave rang so true to life that I was almost in tears. You see, my mother…dear Dolores Welman…is one of those people who simply refuses to change once she finds something she likes. It is surprising enough that she agreed to get a microwave in the first place, but my father, being an early adopter his entire life, managed to convince her to get one a few years after they got married. 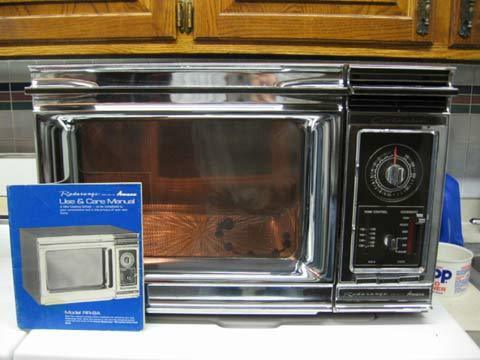 Mom can’t remember the exact date they acquired their first Amana microwave, but the best estimates put it around 1977. From the quick glance I got of the movie’s microwave, I am somewhat convinced it is actually the exact same model my parents had. The picture above is the model we had. The photo doesn’t do the size of this thing justice though. It was the size of a large cooler and had to weigh over 50 pounds. If you ask my mom, the weight served as a testament to its trustworthiness. "Built to last", you know? How do I know what kind of microwave my family used in the late 1970s and early 90s? Because it was the exact same microwave used in our household until 2009 or so. That’s right, we used the same Amana microwave for over 30 years. The only reason we ever abandoned the thing is because my mom eventually moved in with my sister, who had her own microwave, likely manufactured in the last ten years. Mom fought valiantly to convince Debbie the Amana was the superior machine, but my sister won this particular battle. As Dolores will gladly explain to you, modern microwaves simply didn’t heat up food like the ole Amana did. I have tried to explain to her it is likely because that machine was using now-banned radiation technology. It is difficult to describe exactly the kind of noises this microwave made when it was in action. I know most microwaves produce a hum or a whir while heating things up, but this was different. It had the cadence of an alarm, as it’s noise would rhythmically wax and wane. The nature of the sound wasn’t a buzz or a ringing though. Instead, it was like a goat in heat, slowly dying, bleating his last painful thoughts a couple seconds at a time. The family would joke to Mom that no one should stand in front of the microwave for long stretches without a lead apron, but she refused to give it up. “The repairman was shocked it was still in such good condition,” she’d brag. “He said he would fix any problems because of the novelty of getting to work on such a great machine.” We’d debate if he really said “great” and wasn’t instead using an adjective like “old” or “Smithsonian-eligible”. I would also try to point out to her how difficult it was to follow any sort of timing instructions using our old microwave. You see, the timer was just a large dial with hash marks. Every six or seven hash marks, one would be labeled with a number. I tried numerous times to figure out what these intervals of time represented, as they definitely weren’t minutes. Putting the timer on the first hash mark yielded around 15 seconds of nuking. Moving the dial to the “1” amounted to around 90 seconds. So, if the microwaving instructions included any specific intervals of time, a secondary watch or timing device would need to be brought into the operation. And God forbid there was a temperature indication for your food. The temperature was controlled by a lever. At the top of the lever, the machine read “HIGH”, at the bottom “LOW”. However, these also didn’t jive with the way other microwaves seemed to calibrate temperature. If you selected the lowest setting, it was almost like a breezy summer night inside that thing. Lukewarm air circled around your food, effectively accomplishing nothing, imbibing with the general notion of warmth, but not really warming it up at all. Dolores though, she was the microwave whisperer. She had her daily snacks down to a science. She could warm up a biscuit, heat a piece a pizza, or melt butter without having to reset any of the dials. When we suggested our problems with the machine, she was always ready with an answer. She never tried to make the microwave be something it wasn’t. In other words, the problem was her careless daughter, not this mammoth-sized machine from 1977. She knew you can’t make the microwave something it isn’t. Rather than think about what it couldn’t do, she focused on what it could do. It is a character trait I could certainly stand to possess a little more of in my own life. I’ll even give her this–when I went away to college and started using a microwave that didn’t predate my birth, there was no transcendent moment where I thought, “This! This is what I’ve been missing!” The timer was nice, but she was right, the center of the food never tasted quite as warm as it should have. I actually think I can bring this little story full circle. Director David O Russell’s movies as of late have been all about reinvention. The whole focus of American Hustle is how these characters present versions of what they aren’t, what they want to be. Everyone is trying to change, improve, and be different from what they were before. This is great, and an endeavor I’ve pursued myself. However, it is nice to have Dolores around to remind me there is something to be said for being okay with the way things are. Mom isn’t going to fall for the latest fad or be conned into believing something is better just because it is new. You can remove the knobs and add some buttons, but, at the end of the day, it is still a science oven.